Buy a Flight Joystick ??? I'm wondering if its worth $30-$50 to buy a Flight stick for WoWP ? As a new player I really like the game over all, various types/roles of planes, objectives, ect. Better than WoT where ya just drive around, shoot and hope you get team players (UGH). But whats kind of annoying is having to constantly roll the mouse left/right to turn, does a Flight Joystick work better ? If so any recommendations from Vet players on which one to buy would be appreciated. Thanks ! This is really down to preference, some people prefer mouse and keyboard, others prefer a flight/joystick. While both have their ups and downs, I think a mouse and keyboard is currently the best way to make the most out of your planes performance but it might be more natural to use a flight stick for you. Mouse and keyboard has the advantage in situational awareness (being able to look around freely) and aiming with medium to large caliber guns. 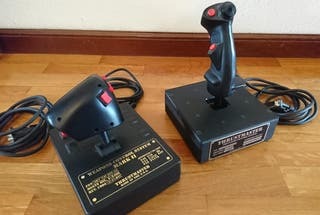 If you are really interested in flight games and want to to try some other ones out I'd say go ahead and buy a joystick. If WOWP is going to be your only flying game, stick with mouse and keyboard until something changes. As far as joysticks go I highly recommend the Logitech 3D Pro or its wireless equivalent. Very good stick for $30 that should last you up to 3 years if you treat it right. It doesn't work as well for some of the more serious sims (i have trouble getting some games to recognize the throttle axis) but it's the most popular stick for WOWP that I know of. Thanks for the advice !! I'm gonna stick to the KB / mouse for now due to your advice. Stick all the way and if its set up right it doesnt get any more realistic.You can still use it with your mouse and keyboard so looking around isnt a problem either.The 3d logiteck is the easiest to set up.I have a thrustmaster also but havent tried it yet. Back when I was beta testing the game, I found a Play Station controller worked rather well. I haven't tried it (again) since returning for 2.0. With a big, gaming mouse pad, I have been content using the key board and mouse. If WOWP is NOT your only game, buy a good joystick. The Logitech sticks are a good starting stick. If you want to do some serious flight sim playing like DCS or Falcon 4.0+, then look into more serious sticks like the CH Fighterstick. *I use my CH stick for when I play flight sims, driving games. In games like War Thunder and World of Tanks i use my joystick for steering and movement as well as shifting gears, ammunition selection firing guns. Just wanted to say "Thanks for all the players" that have given feedback. Edited by nexxus73, 22 May 2018 - 02:22 PM. I've been using a stick since the Sierra Network's "Red Baron" decades ago. For what it's worth, I enjoy using mouse & keyboard for WoWP. I play this because it makes the setup work well, whereas the simulators/combat simulators work best with a yoke/HOTAS. The one thing I really don't like is the loss of being able to free look around me in any direction without having to let go. That's what's stopping me from using a stick atm. The only thing I don't like about the KB/Mouse is in a protracted TnB fight ... having to pick up my mouse and resweep the mouse pad. Is there a better way? I've tried messing with the config settings. Now those were combat flight sims !!! Glad to see folks who play this game on its high end do so with KB & mouse, which is how I am embarking upon WOWP - which is a very accessible platform. ​Eventually I upgraded to the F16 stick, but they all live in a dusty box somewhere in my basement now, I stopped regular gaming for like 15 years, except occasional forays into FPS games (R6 which lead to COD which lead to BF1942 and MOH). What did you play/fly "back in the day" ?? Also got a Logitech stick somewhere from when I started flying (90's) but it has a gameport and you don't see those anymore on PC's ... (maybe I should look for an adapter). My wife doesn't mind ; when I flew AirWarrior, I used to get up at 3AM to fly scenarios with the Americans (where it was 9PM, time difference of 6 hours). I'm using a Logitech Extreme 3D Pro. Edited by GonerNL, 05 November 2018 - 08:15 AM. tried a mouse for about two battles and thought it was stupid, it's a flying game, get a joystick! Mostly single player combat flight sims - EA's Chuck Yeager's Air Combat, the old Lucas games like Secret Weapons of the Luftwaffe, Micropose's original F-15 Strike Eagle, Sphere's original Falcon, the late 80's/early 90's standards. MMO's was not a well known thing yet & certainly not amongst the less computer savvy - which was me. I bought Air Warrior and tried it, but I think I crashed a lot. I vaguely remember being frustrated. My machine was probably not well suited for gaming anyway. I bought a lot of the updated sim stuff like Falcon 3.0, all the Janes sims like Longbow, etc but I had very little time, my computer was outdated, and life just changed gears...until I started playing WOT in like 2015. I bought Air Warrior and tried it, but I think I crashed a lot. I vaguely remember being frustrated. Yeah, it had a steep learning curve ... but then, it was a 'real' air combat simulator. Much more unforgiving then an arcade game like Wowp. You had to actually take off and land and in between stay in the air. When you stalled it was bloody hard to recover, unlike Wowp. I recall that exact issue - recovery from stalls, and I desperately needed a computer upgrade. Not to mention I was only just grasping baud rates, the limitations of my dial-up modem, and the like. I certainly never even thought of issues between client and server communications, ping/latency, packet loss. I didn't know squat about the "online world" back then. Back in the late 80's I was just getting used to the single player combat simulator world, so I went back to my single player games - played on more relaxed forgiving modes of course. I actually brought someone into WOWP just recently who had been asking to play for almost a year - but I only played WOT. I explained that WOWP, WOT, WOWS is basically an arcade world - I play it because of its ease of entry and exit. short matches, jump in and jump out. I told him I also play WarThunder, but it's a very different game. I explained the differences between WG's WOT/WOWP arcade world and Gaijin's WT with multiple modes (arcade, realistic, Sim), the game play, the economies, the grinds, etc. What he described made me steer him towards WT, but he claimed he wanted WOWP...until he played it. Seems what he really wanted was a combat simulator, I think he just liked the idea of a quick entry learning curve...but really wants more of a flying experience. Of course now he's not interested in WOWP, and I am somewhat hooked - as you can see I am already in a clan...I played WOT for almost 4 years and never accepted a clan invitation. But then again, WOWP is a more relaxed and FAR less toxic community that the WOT NA server. Edited by hazmatman, 10 November 2018 - 05:41 PM. 1. Looking around is harder without a free look. There are some useful things: like map, keyboard setting and mouse (but three or four hands would be needed to get it perfect, and humans usually come with two). 2. Aiming - with mouse you just put a cursor on a plane and plane follows it; with joystick you should maneuver the plane in the position, so the sights are on enemy plane and this requires practice.